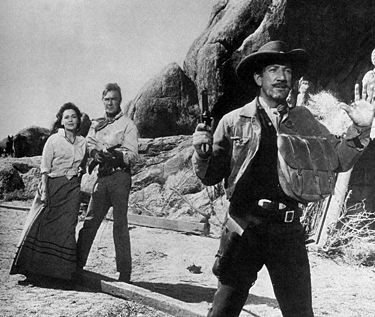 Maureen O'Sullivan, Randolph Scott, and Richard Boone in The Tall T.
The plot of The Tall T (1957) is as clear and pure as a mountain stream. While in town on an errand, affable rancher Pat Brennan (Randolph Scott) loses his horse in an unwise bet and resigns himself to a long walk back to his remote homestead. While hiking on the trail, Pat is picked up by a stage driven by his old friend Rintoon (Arthur Hunnicutt, doing a dad-blasted fine Walter Brennan impersonation). Inside the stage are Willard and Doretta Mims (John Hubbard and Maureen O'Sullivan), newlyweds who have hired Rintoon to transport them on the first leg of their honeymoon. The stage travels to a rest stop, where it is ambushed by three bandits, Frank (Richard Boone), Billy Jack (Skip Homeier), and Chink (Henry Silva), who believe they are robbing the regularly-scheduled stage for its bank money. The bandits shoot Rintoon dead and take Pat, Willard, and Doretta hostage. Doretta is led into the station to make dinner for the bandits; while she is gone, Willard cravenly tells head bandit Frank that he attacked the wrong stage but that his wife is the daughter of a millionaire copper baron more than capable of paying a fat ransom for her safe return. The rest of the film plays out like an elaborate chess match, with Willard negotiating for his own safety, the bandits negotiating for the ransom, and Pat and Doretta waiting for a chance to escape. Pat: "Did you love him?" Pat: "That's not what I asked. Did you love him?" Doretta: "Yes! Yes, I did." Pat: "Mrs. Mims, you're a liar. You didn't love him, and never for one minute though he loved you. That's true, isn't it?" Doretta: [pause] "Do you know what it's like to be alone in a camp full of roughneck miners, and a father who holds a quiet hatred for you because you're not the son he's always wanted? Yes, I married Willard Mims because I couldn't stand being alone anymore. I know all the time he didn't love me, but I didn't care. I thought I'd make him love me...by the time that he asked me to marry him, I'd told myself inside for so long that I believed it was me he cared for and not the money." The scene ends with Pat condemning Doretta for her self-pity, before taking her into his arms, advising her that "sometimes you got to walk up and take what you want," and kissing her. Because she is honest with Pat, she won't have to worry about being lonely ever again. Frank: "I'm gonna have me a place someday. I thought about it, I thought about it a lot. A man should have somethin' of his own, somethin' to belong to, to be proud of." Pat: "And you think you'll get it this way?" Frank: "Sometimes you don't have a choice." As should be clear from the above interactions with Doretta and Frank, Pat is the single person in The Tall T whose public self is congruent with his private nature. The most striking aspect of Scott's performance as Pat is his infectious, bright smile. In the film's first twenty minutes, Pat grins so much (at stationmaster Hank, at Rintoon, even at his previous employer Tenvoorde) that we quickly realize that he is a man fully in love with his life and his friends. After he's taken captive by Frank's gang, Pat has less reason to smile, but his integrity oozes out of his pores as regularly as the sweat stains that periodically surface on the back of his yellow shirt. Frank briefly contemplates letting Pat go, but he quickly realizes that it's "dumb even talkin' about it" because Pat's innate goodness will lead him to warn the stage or play hero. This is not to say that Pat is a perfect, stoic hero. He admits that he's scared to both Frank and Doretta, bbut in The Tall T's world of lies and masks, Pat is a man who has chosen both to do good and be good, a man who walks up and takes what he wants without ambiguity or deception. He is as clear and pure as a mountain stream.